In the lead up to Air Max Day 2019, we’ve unearthed our entire back catalogue of exclusive Air Max releases – hailing from way back in 2005 – to retell some of our favourite stories from over the years. Adding to this coveted roster and releasing just in time for the annual event, we’ve partnered with Nike to release a size? exclusive iteration of the brand’s Air Max Light silhouette, retooling the model with a host of premium updates. The Air Max Light was initially launched in 1989 and was only the second release from Nike to feature Air Max technology within the midsole. Originally marketed as the Air Max II, the runner was later renamed Air Max ‘Light’ due to the construction process of the sole unit, which resulted in a substantial weight difference to that of its predecessor. Similar to Nike’s past space-inspired releases, our Air Max Light exclusive takes inspiration from interplanetary exploration, light and reflectivity, and most importantly, zero gravity. Over the next week, we’ll be sharing more details on the size? exclusive, so stay tuned. The Nike Air Max Light size? 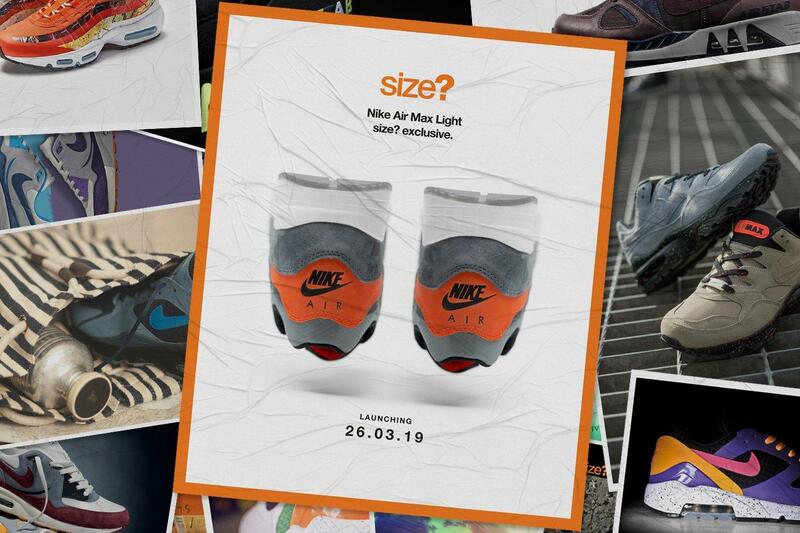 exclusive will be available on Air Max Day 2019, Tuesday 26th March, via the size? previews app and in size? stores.